Who doesn't love Halloween? 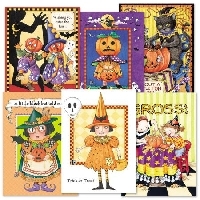 For this swap, you will send 2 greeting cards or 2 note cards to 2 partners featuring anything Halloween. That's 2 cards, 2 partners, 1 to each partner. Must be a card that folds, no postcards. Store bought or handmade. If handmade please send something you would like to receive. Write a message to your partner, anything you care to talk about. Rate a 5 when you receive your card, hearts are up to you. Senders choice. Established swappers only with rated 20 type 2 or 3 swaps and must have a 4.98 and no unresolved 1's to active members and no 3's within the last 3 months. I will angel if needed after rating a 1.